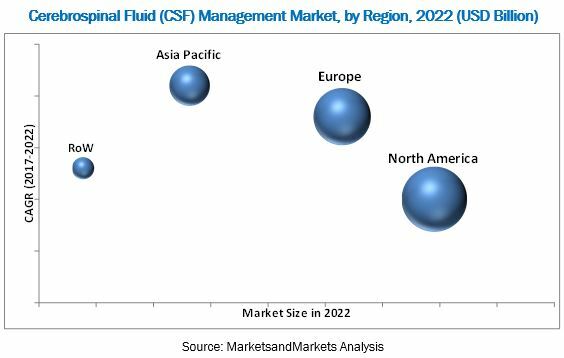 [120 Pages Report] The global cerebrospinal fluid management market was valued at USD 1.20 Billion in 2016 and is projected to reach USD 1.56 Billion by 2022, at a CAGR of 4.4%. Base year considered for the report is 2016 and the forecast period considered for this report is 2017–2022. The major players in the global cerebrospinal fluid management market are Medtronic plc (Ireland), Integra LifeSciences Holdings Corporation (US), B. Braun Melsungen AG (Germany), DePuy Synthes (US), Spiegelberg GmbH & Co. KG (Germany), SOPHYSA (France), Natus Medical Incorporated (US), Dispomedica GmbH (Germany), Delta Surgical Limited (UK), Argi Grup (Turkey), Moller Medical GmbH (Germany), G. SURGIWEAR LTD. (India), and Wellong Instruments Co., Ltd. (Taiwan). On the basis of product, the global cerebrospinal fluid (CSF) management market, is segmented into shunts and external drainage systems. In 2017, the shunts segment is expected to account for the largest share of the global cerebrospinal fluid (CSF) management market. The shunts market is further segmented into ventriculoperitoneal (VP), ventriculoatrial (VA), ventriculopleural (VPL), and lumboperitoneal (LP) shunts. Over the years, the disease burden of hydrocephalus has increased considerably, increasing the demand for CSF management devices as a method of treatment. Cerebrospinal fluid (CSF) management involves the use of devices such as shunts and external drainage systems to maintain the flow of CSF and drain excess fluid from the brain. The cerebrospinal fluid (CSF) management market is projected to reach USD 1,561.1 million by 2022. Factors such as the high prevalence of hydrocephalus and the subsequent increase in the number of shunting procedures and the growing geriatric population are driving the growth of the CSF management market. Dearth of trained professionals and complications related to CSF shunts are challenging market growth to a certain extent. There is a significant shortage of neurophysicians and neurosurgeons worldwide. With the rapidly increasing aging population, the current number of neurosurgeons is inadequate to meet the healthcare demand. One of the greatest limitations is the inability to produce a sufficient number of trained neurosurgeons in the required amount of time. This shortage of trained professionals in neurosurgery extends to North America, Europe, Asia Pacific, Latin America, and Africa. Hydrocephalus can be treated with a shunt system; however, this treatment often includes complications. The most common shunt complications include malfunction, infection, and shunt obstruction. According to Pediatric Emergency Medicine Reports, about 40% of shunts fail within the first year and 56–80% by 10 years. Additionally, between 8–10% of shunts eventually become infected. Shunt malfunction can lead to an acute increase in intracranial pressure (ICP), causing irreparable impairment of the brain. However, developing economies such as Brazil, Russia, India, China, and South Africa (BRICS) are among the fastest-growing economies in the world with a large patient base of hydrocephalus. The presence of such a huge patient base in this region, along with rising healthcare expenditure, is expected to serve as an opportunity for players in the CSF management market. VP shunts are superior to other shunts as they reduce the chances of revision surgery and the average length of hospital stay. VP shunts are the most common type of shunts for draining excess CSF. These shunts generally contain a pressure-sensitive valve that releases CSF when the pressure reaches a certain level. In VP shunts, a catheter is inserted into the ventricle with tubing passing subcutaneously through the thorax, into the peritoneal cavity where the CSF absorption takes place. Over the years, VP shunts have been found to be superior to other shunts as they reduce the chances of revision surgery and the average length of hospital stay. VA shunts are less common than VP shunts. These shunts enable CSF to flow from the cerebral ventricular system to the atrium of the heart. In some patients, the peritoneal space is inadequate, necessitating the use of an alternative distal site for CSF drainage. Common reasons for peritoneal inadequacy include intra-abdominal infection and scarring due to prior procedures or intra-abdominal pathology. Additionally, VA shunts are used in patients who already have VP shunts implanted but require further drainage to achieve symptom relief. An LP shunt diverts CSF from the spinal space in the lumbar region to the abdominal space. It is used to treat non-obstructive hydrocephalus, normal pressure hydrocephalus, elevated intracranial pressure, and idiopathic intracranial hypertension. An LP shunt consists of a catheter inserted between two lumbar vertebras into the thecal space, which is then tunneled around the abdomen into the peritoneal cavity for absorption. The adoption of these shunts is low as they are associated with a greater likelihood of shunt revision, increased hospital stay, and greater overall charges to the healthcare system. VPL shunts are safe and viable second-line CSF shunts for cases in which ventriculoperitoneal and ventriculoatrial shunts are unsuitable. While VPL shunts have a high revision rate, their complication rate is comparable to that of VP shunts. VPL shunt survival can be improved by careful patient selection and the implementation of a combination of valves with anti-siphon devices. According to the Hydrocephalus Association, one in 500 children is affected worldwide, and one to two of every 1,000 babies is born with hydrocephalus. This is estimated to contribute to over 200,000 cases each year of congenital hydrocephalus in infants around the world. Moreover, children can acquire hydrocephalus after birth due to brain hemorrhage, infection, tumors, trauma, or parasites, thereby increasing the total number of pediatric patients with hydrocephalus. This rising prevalence of hydrocephalus has led to an increase in shunting procedures. The high prevalence and incidence of hydrocephalus in the pediatric population, along with the rising number of shunting procedures, is expected to drive this market segment. While hydrocephalus is considered common in infants and the elderly, its occurrence in adults is also rising. Hydrocephalus also goes undiagnosed and untreated in younger adults, leading to substantial workforce losses and healthcare costs. SHYMA (syndrome of hydrocephalus in young and middle-aged adults) is a type of hydrocephalus that affects the adult population. However, this type of hydrocephalus is complicated; not much is known about the disease or its causes. Moreover, there are two other forms of hydrocephalus that affect adults hydrocephalus ex vacuo and normal pressure hydrocephalus. However, according to the Hydrocephalus Association, there are fewer than ten centers in the US specializing in treating adults with hydrocephalus. According to the Hydrocephalus Association, over 700,000 older Americans are living with NPH. Moreover, one in every 1,000 senior citizens in the US develops NPH each year. The global cerebrospinal fluid management market is projected to reach USD 1.56 Billion by 2022 from an estimated USD 1.26 Billion in 2017, at a CAGR of 4.4% during the forecast period. The growth of this market is majorly driven by factors such as the growing geriatric population and the high prevalence of hydrocephalus and the subsequent increase in the number of shunting procedures. The cerebrospinal fluid management market is segmented by product, end user, and region. Based on product, the market is segmented into shunts and external drainage systems. The shunts market is expected to grow at the highest CAGR during the forecast period. The high growth in the shunts market can be primarily attributed to the growing number of shunting procedures performed worldwide as well as the increasing number of revision shunt surgeries. Based on the type, the shunts segment is further segmented into ventriculoperitoneal (VP), ventriculoatrial (VA), lumboperitoneal (LP), and ventriculopleural (VPL). The external drainage systems segment is further segmented on basis of type into external ventricular drainage and lumbar drainage. Based on end user, the global cerebrospinal fluid management market is categorized into pediatric, adult, and geriatric. The pediatric segment is expected to register the highest CAGR during the forecast period. This can primarily be attributed to the high prevalence of congenital hydrocephalus along with the rising number of shunting procedures in the pediatric population. 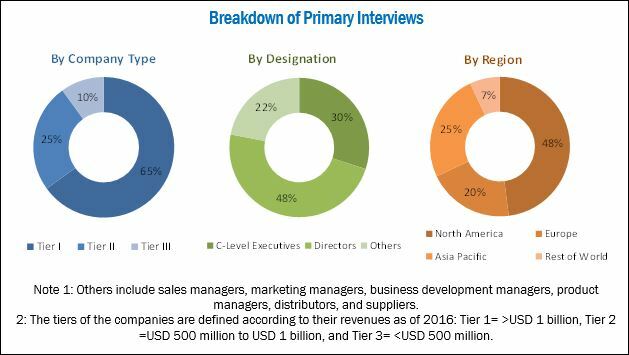 Geographic segments in cerebrospinal fluid management market report include North America, Europe, Asia Pacific, and the RoW. North America accounted for the largest share of the market in 2017. The large share of this region can primarily be attributed to the rising prevalence of hydrocephalus, increasing funding for hydrocephalus research in the US, and the launch of organizations such as Hydrocephalus Canada. The dearth of trained professionals and complications related to CSF shunts may challenge market growth to a certain extent during the forecast period. For instance, in South Africa, there were 0.061 neurosurgeons per 100,000 people in 2016. This unavailability of medical professionals in developing countries is likely to reduce the chances of diagnosis and treatment of conditions requiring CSF management. The major players in cerebrospinal fluid Management market include Medtronic (Ireland), Integra (US), B. Braun (Germany), DePuy Synthes (US), Spiegelberg GmbH & Co. KG (Germany), SOPHYSA (France), Natus Medical (US), Dispomedica GmbH (Germany), Delta Surgical Limited (UK), Argi Grup (Turkey), Moller Medical GmbH (Germany), G. SURGIWEAR LTD. (India), and Wellong Instruments Co., Ltd. (Taiwan).